This Demonstration illustrates a theorem in classical dynamics known as the intermediate axis theorem . When an object with sufficiently different moments of inertia in the three principal directions is thrown into the air, the rotation around the axis with the minimum or maximum moment is stable, whereas the rotation around the axis with the intermediate moment is unstable . The three principal rotation axes of the paddle in this Demonstration cross at its centroid. The dimensions of the paddle are such that the minimum moment of inertia is around the axis parallel to the handle , the maximum moment is around the axis parallel to the blade , and the intermediate moment is around the axis perpendicular to the blade . The animation rotates the paddle around its axis by giving it an initial angular speed. This rotation is unstable and causes the paddle to flip over around the axis at regular intervals. 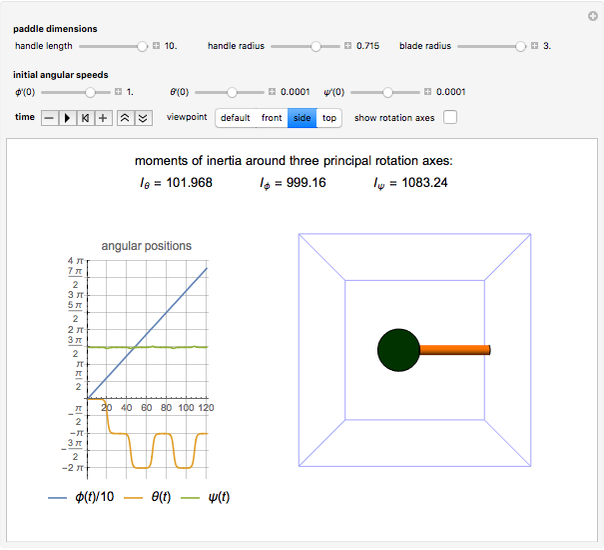 The plot of the three angular speeds around the principal axes clearly shows that the axis flips over by &PlusMinus;180° from its equilibrium position. Gravity is neglected in this Demonstration in order to isolate the rotations and avoid translation of the center of mass. 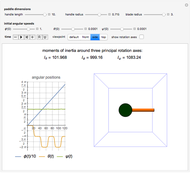 This way, the paddle is kept within view of the Graphics3D plot range. This phenomenon was demonstrated in space by the Russian astronaut Vladimir Dzhanibekov . There are two conventions for Euler angles; see the Demonstration Euler Angles. 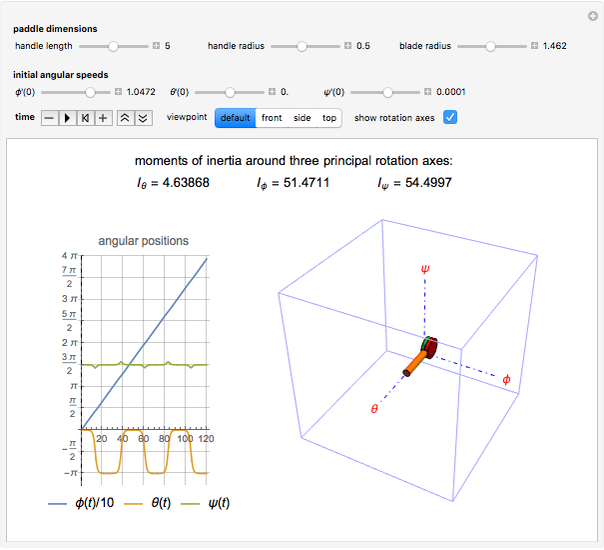 D. Schmid, "Stable and Unstable Rotations: The Tennis Racket Theorem," Ask the Van (blog). (Jun 4, 2015) van.physics.illinois.edu/qa/listing.php?id=24571. E. Johnson. 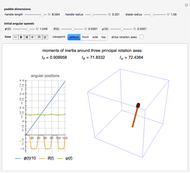 Torque Free Motion of a Rigid Body about Intermediate Inertia Axis [Video]. (Jun 4, 2015)www.youtube.com/watch?v=qEWwIV9Z-eA. Dzhanibekov Effect in Space (in Russian) [Video]. (Jun 4, 2015) www.youtube.com/watch?v=L2o9eBl_Gzw. M. Iwaniuk. 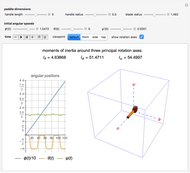 "Dzhanibekov Effect or Tennis Racket Theorem" from Wolfram Community—A Wolfram Web Resource. (Jun 4, 2015), community.wolfram.com/groups/-/m/t/498246?p_p_auth=PV4kRYzg. Erik Mahieu "The Intermediate Axis Theorem Applied to a Ping-Pong Paddle Flip-Over"